Browse or search the Cherokee genealogy queries posted to All Things Cherokee in June 2014. Find others researching your family tree. Query: Surnames: CROUCH, FULTS and/or FULTZ, PATRICK, ALLISON, ADAMS, STONER and McBRIDE. They all came either from Tennessee or from North Carolina. Specific counties listed were Warren of Tennessee and Guilford of North Carolina. They ended up living mostly in Oklahoma and Texas. Individual names: My grandmother, Annie CROUCH (b. 1886) and her parents-Albert CROUCH (b. 1846) and Sarah Evaline FULTS (b.1846). Her grandparents- Elisha CROUCH (b.1806) and Nancy McBRIDE (b.1818), David FULTZ (b. 1827) and Amanda PATRICK or FITZPATRICK (b. 1827 or 1828). Great grandparents include John McBRIDE (b. 1789) and Sarah “Sally” ALLISON (b. ? ), Jesse FULTS (b. 1802) and Sarah STONER (b. ? ), and Richard CROUCH (b. about 1777) and Charity ADAMS (b. 1783), plus one unknown couple which were Amanda PATRICK’s parents. I have specifics on dates and places, as well as tentative Indian census record numbers for many of them. I would appreciate any help I can get. Thank you. Query: In a book of our COBB family history, it is listed that one of our ancestors was a full-blooded Cherokee. Her name was America Amanda WILSON, Mother Quilla WILSON, and she was married to Samuel Elijah COBBS on June 11, 1849. They had 9 children named Aquilla Alexander COBB, b. 1851, Martha Hunt Olean COBB, b. 1853, m. Kinchion Pratt STRICKLAND, 1879, Sarah COBB, b. 1855, m. Kinchion Peeler STRICKLAND, 1881, Mary Livey COBB, b. 1857, m. J. P. LORNEGAY, Nancy COBB, b. 1858, m. Dolphus MARSHALL, Hulday Virginia COBB, b. 1859, m. Constantine Thomas NEWTON, Susan COBB, b. 1863, m. George W. NEWTON, Douglas COBB, b. 1867, m. Isabella Talclah STRICKLAND, 1891 and Cynthia A. Missouria STRICKLAND, 1899, and Rebecca Pocahuntus COBB, b. 1867, m. John Wesley Newton, 1881. I have a great deal more information on their children and their dates of death but felt this was enough for identification. If you have any information, please contact me. Thank you in advance. Query: Need info on my full blood Cherokee GGM Sally L. Johnson Campbell born 1-15-1872. -Married Landry Campbell -from Scotland3-10-1887. He immigrated to US from Scotland and traveled from NY?? down through Tennessee and settled in Louisiana. He met and married Sally along the way. Not sure if he traveled through Oklahoma also. Query: I am from south Carolina and my people are Cherokee mix. My brother is carl whitewolf hood. Owe people are from Cherokee north Carolina. I want to know how much blood I have. Query: My Cherokee relative was Elizabeth MATHESON who lived in Georgia, found by Ms. Berry, (Thank You!) She was the ancestoy of the Frances Marion COCHRAN family from north Georgia and lived there among whites before the Removal. I’m not considered Cherokee but would like to find my extended family. Query: Hello, my grandmother, Martha Ann Martin (Lawrence-maiden name), was born 01/19/1906 and passed away October 1980. Her mother was a 100% Cherokee, but I am not sure of her name. I am researching information as far as what tribe she was from, etc.. My father’s name was Norman Jay Martin, February 28, 1939 and passed away November 30, 2000. I am hoping to also find out what part of Indian I have in me. I would really appreciate any help you can give me. Thank you! Query: I believe my great grandmother,delilah,who married josiah shaw may have been of cherokee blood.in doing a family tree,i could find no info about delilah.but elder members of my family say that a cherokee indian man lived with my grandfathers family and it is said he was the brother of delilah.my older iter remembers a younger indian man visiting my father when he was a child.she would have lived in monroe county,ohio.but may have come from pa or wva.any help would be appreciated. Query: I’m curious about my family roots but Im at a stand still and unable to find any other information. My Great grandfather married a woman by the name of Drusilla Elizabeth Mosley. This was her adoptive name. Her Cherokee given birth name being Blizard Heels.Between her birth year in 1910- and about 1906 she was left by her father in a town in west virgina between the ages 3-5. Her mother possibly had died giving birth to her or shortly after giving birth. Please if anyone knows anything about her father or mothers names or just information please let me know. Query: I’m looking for information on my great-grandmother, Zettie Cortney Hunley. Her mother was full cherokee, as we are told. Zettie married Henry Hunley and they lived in the Caryville area of East Tennessee. Please contact me. Query: I’m looking for any info on my g. grandmother. Family knows very little. My grandmothers maiden name was Anna Eliza Whitt. She married Charles Boone. My grandmothe was born Nov. 12, 1898. Her mom died when she was very young. Family is guessing her name was Asbury???? My grandmother mentioned a place called Baptist Valley, Va. My granny only ever mentioned she was Indian once. She said they told people they were “Black Dutch”. No one knows of my granny’s mother. No one has any info on her, her name, where she was from…nothing. If anyone could give me any info I would appriciate it. Thanks. Query: Looking for family related to Robert Arthur Morris, Stony Point Missouri. Query: My grandmother told me I had Cherokee blood, how does one find out? Query: My grandfather, James Edward LEE, was born in Dover, Tennessee, January 9, 1877. I understand his mother was a Cherokee woman. I would love to know more about her and her family. Query: Looking for Info on my dad’s side. The is cherokee and Choctaw. My 2nd great grandparents were James Walker Sanders and Nanie Peygnhaus in Texas both born in 1855. This is as far as I can go. Please if you can help would be much appreciated. Query: I am searching for Cherokee History of either Rebecca R. Zachary or James F. Flowers. They resided in Pickett County, Tn. I was informed that my great-grandmother, Rebecca was full blooded Cherokee. If anyone has information, I would be much appreciative of this. Query: I have completed the genealogy on the England side if anyone needs any info. I’d be glad to share. Query: Need help finding info on my Grandma’s family, Her name was Bobbie Green born 1933 in Oklahoma she had always told us we were Cherokee descent, she herself said to be 1/2. Now I can track her parents okay but I am having so much trouble finding records on her grandparents her grandma supposedly was Full Cherokee her name Cynthia A.Green ( maiden name Reeves) born Pike,Georgia in 1835, her grandpa was George C.Green born in Cedar town, Georgia in 1844. They were married Oct 13, 1866 in polk, Georgia! Any help would be great, I am almost certain we are native american because my ancestors moved to Oklahoma and Texas to claim land its just proving it! Query: I am related to John Smith 1/2 Cherokee, and Peter Brown 100% Cherokee Indian from both grandmother side: Lovina Thompson & Grandfather side Marion Helton. I would like more information what tribe were they from? Query: Hello, I’m having difficulty finding out if I’m cherokee. Let me give you a little background. I found out about a year ago who my mom was. Upon looking at ancestry.com it said she was cherokee. That’s all it said. No tribes nothing. How do I find out tribe, what percentage I am and if I qualify for any benefits? Query: I am looking for information on my father’s family – and especially on my grandmother. My father was James Douglas McCuen, his mother was Faylene (Fay) Douglas McCuen father was Willis Alexander (Will A.) McCuen. She had a brother named Jess who married a woman named Etta. I know Jess and Etta had several children. Willis and Fay had three sons, Euen, James and George. My dad said that his father was married before his mom to a woman on the Cherokee reservation in OK and he had half sisters there. No other details. Willis was born in 1876 not sure about Fay. Married somewhere about 1910. Lived in Paris, Arkansas and Fort Smith, Arkansas. Any help would be appreciated. Query: I am interested in finding out if my Cherokee heritage is valid. My Mable Bradshaw was born March 4, 1887 in Webbers Falls, OK. Her biological father was a Cherokee man but he did not marry her mother (Ella Johnson Bradshaw). We were told his name was R. J. Tyner and we found his grave at Webbers Falls, OK.
Query: I have been told that I have Cherokee. My mom told me that her father elone Lang had a major amount of Cherokee. I would definitely like to find out more. Query: My maternal grandfather was given to a church in 1911 to adopt. On the papers the family ( Satterfield) claimed their daughter had a baby with an “Indian”. The baby was “just too dark” for them to keep. He was adopted by Juitt Hood in Louisville Ky. For some reason my grandfather knew all this and had contact with his father who said he was full Cherokee. This part of my heritage is very important to me. Query: Looking for Sims family and James family. My gg grandfather was Thomas Sims. My g grandmother was Arianah Sims. 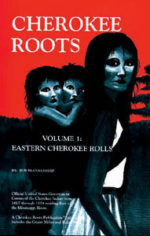 Looking for Cherokee connection. She was full Cherokee. Need connection for registration. Please. Query: Would like to research my Cherokee heritage. Query: I am looking for a full blooded cherokee man by the last name of Fanning. I understand that he was married to a white woman, and last understanding of things, he was seen (with wife) in Kentucky. I believe this was in the 1860’s (maybe as early as 1840’s), and was feared very much because he was as good (and deadly) with a bullwhip as a gunslinger with a gun. His decendents (some of them) would be Boker. Arthur Boker is said to be his son. If you know of him, was he ever enrolled in the dawes roll/records? If so, what was his number, and his date of birth, place of birth, full name, etc? I would like ti know all I can of him. He would be my great grandfather, or maybe great-great gransfather.